Vouchers are taxpayer-funded government subsidies for private schools and vendors with no accountability for results. Vouchers reduce fair access to educational opportunity, weaken rights for students with disabilities, and expose taxpayers to fraud. Only district and charter schools can deliver on the promise of quality school choice with both transparency and accountability in the use of public dollars. While often repackaged under different names, or with varying mechanics or eligibility requirements, the general concept of a school voucher is the same. For each of the following voucher systems, students receive the voucher entitlement instead of attending public school or were never enrolled in a public school in the first place depending on the requirements of the program. School voucher programs do not have to comply with the same rules as local public and charter schools nor do they have to serve all students. Private schools are subject to no oversight for quality by the State of Texas. In a traditional voucher program, the state provides families with all or part of the funds which would have been used to educate their child in public school. This is often based on the average per pupil state expenditure for public school and is used to pay for all or part of private school tuition. Private schools are not held to the same accountability and transparency requirements as schools in the public system, and are not required to serve all students. Corporations can allocate an amount equal to all or part of their state tax liability to a private scholarship-granting organization. These private organizations manage and distribute voucher funding to families to be used for non-public educational expenses. Unlike a charitable contribution, the individual or corporation often receives a dollar-for-dollar reduction in state taxes owed, so they have in effect “donated” nothing. The state provides families with the bulk of the funds that would have been used to educate their child in public school. The funds are placed in an authorized Education Savings Account (ESA) and may be used for private school tuition or other non‑public educational costs, which may include homeschooling, online learning, tutoring, or to purchase other products and services from private vendors. Families of qualifying students receive state funding to pay for private education or services in exchange for waiving their rights under federal disability law. More often than not, private programs and services do not provide the same protections, rights, and quality assurances as the public school system. While promoted as a solution for families dissatisfied with services in the public school system, in reality, special education vouchers are employed as a political gateway to universal vouchers. Any legislation aimed at removing funding from the public school system to subsidize private education, even if it’s for students with special needs, is a misguided approach to education reform. Protections for students and families provided by Texas public schools aren’t guaranteed in private settings with vouchers. 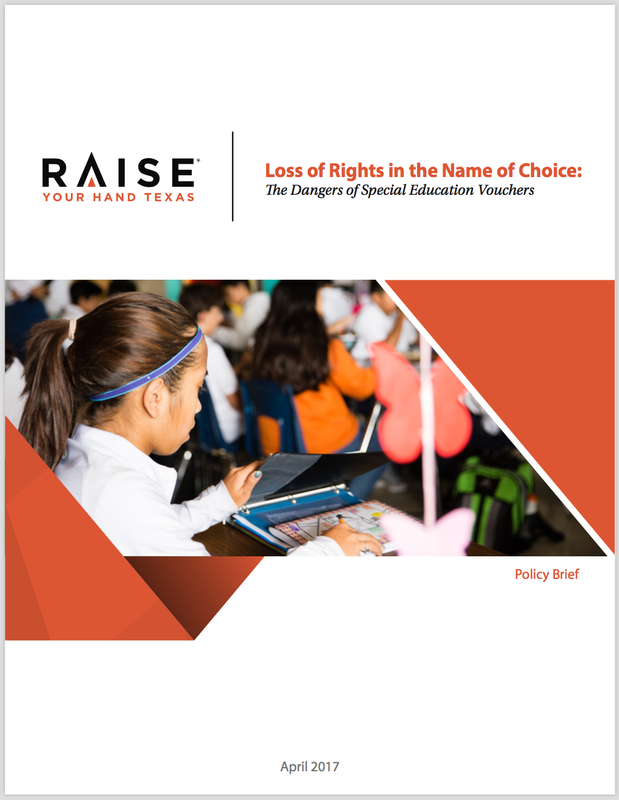 Our position paper describes the four major weaknesses of special needs vouchers. There exists a national political effort to promote traditional vouchers, Education Savings Account (ESA) vouchers, and tax credit scholarship vouchers in the name of assisting students with disabilities. While promoted as a solution for families dissatisfied with services in the public school system, in reality, special education vouchers are employed as a political gateway to universal vouchers. Vouchers for students with special needs represent a dangerous proposition that can lead to a loss of rights and quality educational opportunities. When it comes to school vouchers, additional choices do not necessarily equate to higher quality choices. 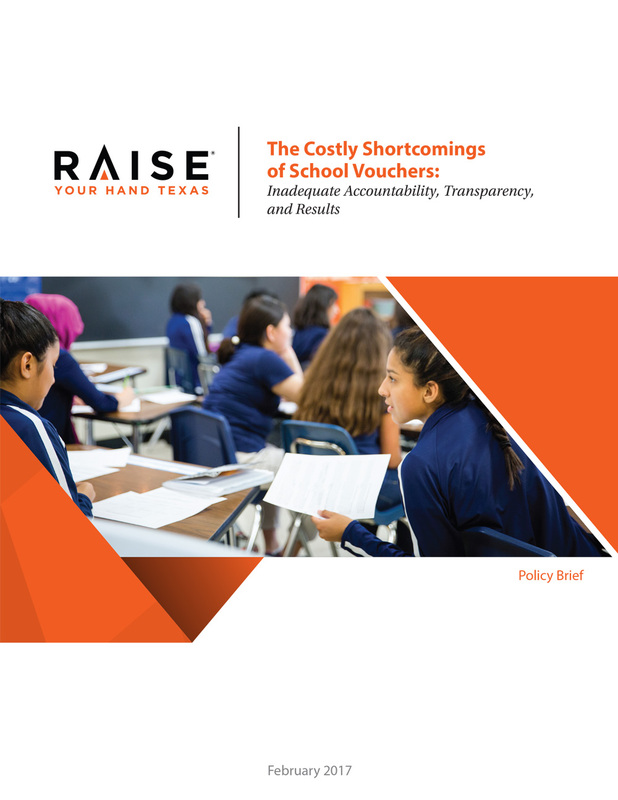 As explained in this brief, school voucher programs that operate outside the public system with limited or no transparency and no accountability requirements do not have a track record of success. The use of tax credits to reimburse donations for private school tuition is a shell game. It is intentionally designed to mislead the public by making a government subsidy for private schools funded through a corporate tax break look like philanthropy. 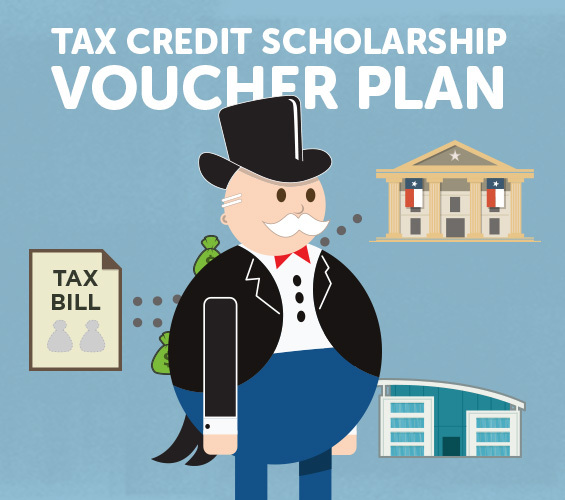 Our blog and video explain the mechanics of tax credit scholarships and how they remove funds from the accountable public school system. 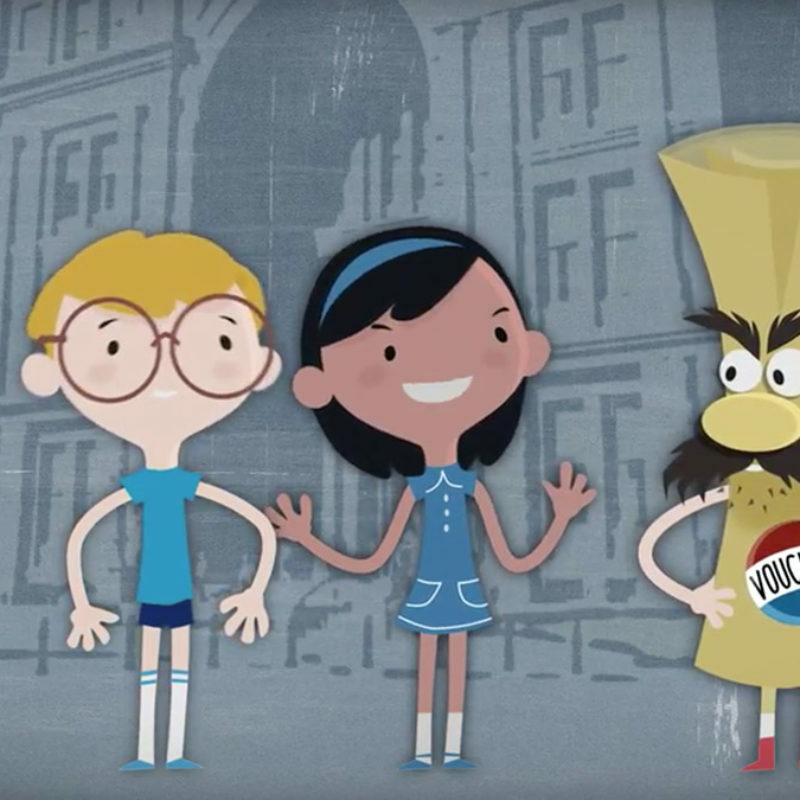 The library contains a wealth of resources about school vouchers and their effects on students, families, schools, and taxpayers. The library is regularly updated to include our most current materials and publications. TAXPAYER DOLLARS WOULD PAY FOR VOUCHERS, WITH NO OVERSIGHT OR ACCOUNTABILITY IN RETURN. ESAs, tax credit scholarships, and other school voucher programs do not have to comply with the same rules as local public and charter schools. Private schools are subject to no oversight for quality by the State of Texas. ESAs allow tax dollars to be spent on a wide array of private vendors with zero accountability apart from outright fraud. VOUCHERS ARE GOVERNMENT SUBSIDIES FOR PRIVATE SCHOOLS. ESAs, tax credit scholarships, and other school vouchers use tax dollars to pay for students to attend private schools at government expense. VOUCHERS REDUCE FAIR ACCESS TO EDUCATIONAL OPPORTUNITY FOR TEXAS STUDENTS. ESAs, tax credit scholarships, and other school vouchers divert scarce resources from public schools that serve all students to pay for private schools for a few. Reports from other states show ESA vouchers are not used by students from working families, but are used primarily by wealthier families who can afford the additional costs of private school not covered by the voucher. SCHOOL VOUCHERS ARE A HIDDEN TAX ON TEXANS. School vouchers divert a portion of property taxes away from local public schools and send them to private schools and vendors in other parts of the state. Voucher proposals under consideration provide no transparency of information or accountability for results. THERE IS ZERO EVIDENCE ESAs WORK. Despite voucher advocates’ efforts to spin the mixed data on vouchers as a whole, there is no research showing ESAs work. ESAs WEAKEN THE RIGHTS OF STUDENTS WITH DISABILITIES. ESAs can require students with disabilities and their families to waive hard-won legal protections as a condition of receiving the voucher–a high price to pay. Students also lose the guarantee of inclusion in a mainstreamed, or “least restrictive environment” classroom with a trained teacher. ESAs ARE HIGHLY VULNERABLE TO FRAUD AND ABUSE. 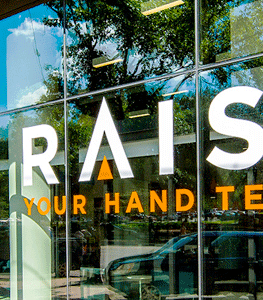 ESAs provide funds directly to individuals to pay not just for private school tuition, but for a whole range of products from private vendors including tutoring, books, and computer hardware. It is often difficult to determine if these expenditures are legitimate and audits in other states have identified numerous instances of fraud and abuse using taxpayer funds. 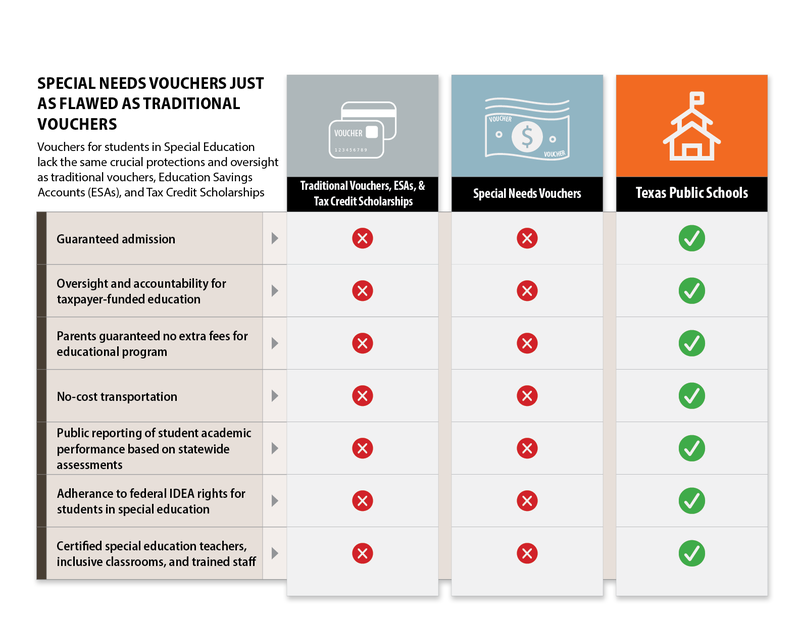 First, Mr. Voucher tried to convince Texans that that Education Savings Accounts (ESAs), tax credit scholarships, and other voucher schemes are good, but instead ended up being schooled about how vouchers hurt Texas students, schools, and taxpayers. Next, he tried to convince Texans that any and all choice is good for students, and again was schooled about the importance of quality school choice–choice with transparency and accountability–when public dollars are used. 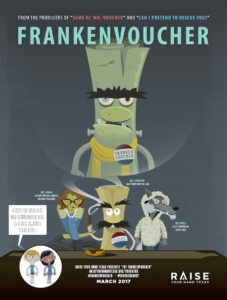 In the third installment, a new monster voucher arrived on the scene – FrankenVoucher – and he was twice as devastating. Can I Pretend to Rescue You? Though marketed as distinct from traditional school vouchers, the ESA is simply different dressing on a familiar scheme to redirect public taxpayer dollars to pay for private, unregulated, and unaccountable services. The Education Savings Account (ESA) voucher allows parents to hold public funds in an account to be used for private school tuition, home schooling, private tutors, online courses, and purchases from an array of private vendors. While an ESA voucher may sound appealing to parents as extra state support to pay for educational services for their child, ESAs pose the same problems as traditional vouchers in terms of lack of accountability and resulting harm to students in the public school system. In many cases, the benefit provided is far less than the cost of tuition raising additional concerns about fair access to educational opportunity. When a parent uses tax dollars for private tutoring, online courses, or instructional materials, there is no guarantee those services are high-quality or that they will result in better academic achievement. The use of the dollars are not transparent or accountable to taxpayers the same way public schools are held accountable for student achievement, fiscal responsibility, and child safety. Because ESA vouchers are directed to unregulated entities, the potential for fraud is high. An infusion of educational resources for private entities would result in a sizeable new crop of untested and unaccountable providers. Like traditional vouchers, ESAs remove public funds from the public system, resulting in fewer resources for the 5 million+ students who are still educated by public schools. Fiscal implications for the state would be high, especially if ESAs are available to students who were previously enrolled in private or home schools. Our public school students, who will power the vast majority of the future Texas workforce, deserve a world-class education. Texas school districts and charter schools are delivering numerous high-quality educational choices for parents with transparency and accountability for results. Districts across the state are embracing quality school choice in a variety of ways. 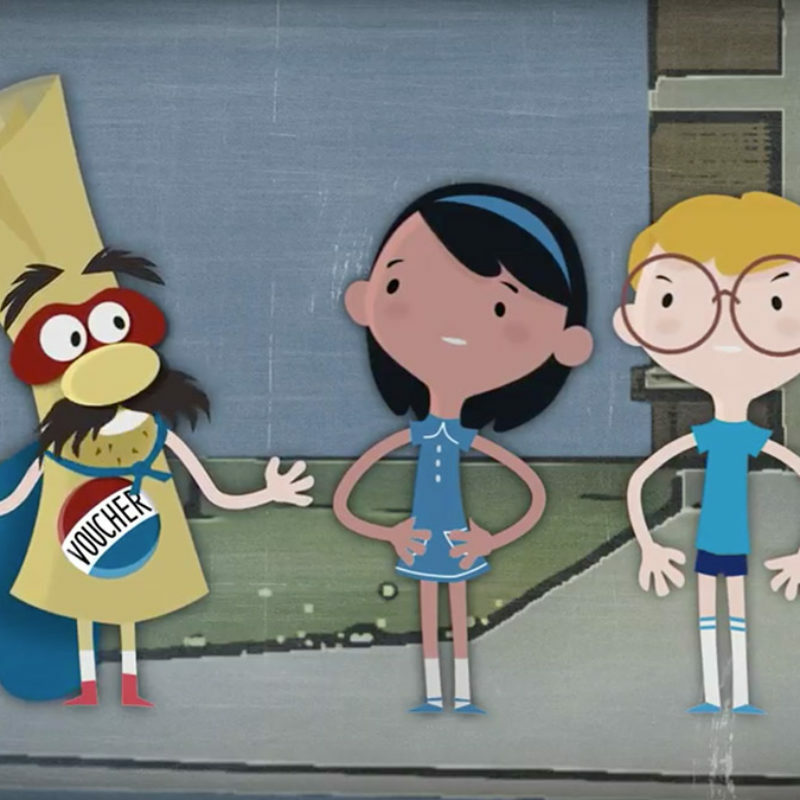 Watch to learn more about locally driven innovations and choice opportunities for Texas families.